Having introduced you last week to the massive bird extinctions that occurred across the Pacific. Today I’ll talk about the causes of this massive extinction. On the face of it the culprit is fairly easy to identify, humans. Yet this culprit has apparently not always been obvious. Nor, in fact, is simply saying “humans did it” a particularly illuminating answer. If humans did it, why didn’t the continents lose almost their entire avifaunas as well? What was going on on those islands? The presence of a lost avifauna was first detected in New Zealand. The bones of many species, no longer found on the islands, were found and described by scientists. Massive geese, crows, eagles, and moa unlike anything found on the island alive. And these extinctions required an explanation. And a number of explanations were offered. One explanation was genetic senescence, that the species of birds were naturally declining. In spite of the fact that scientists like Mantell and Haast had found incontrovertible evidence that humans had eaten moa and other large birds it was argued that they had gone extinct prior to the arrival of humans. Once this argument had been dispatched it was modified to the idea that most species were declining prior to the arrival, and many had been lost by then. Other suggestions included disease and rapid climate change. That these species, which had survived for millions of years and had all simultaneously succumbed to disease, climate change or their own crippling genetic inferiority at exactly the same time as humans had arrived was simply a remarkable coincidence. The only thing it could not have been was humans and human-introduced predators. Why then, you might ask, are the faunas of New Zealand, Hawaii, and other island groups so vulnerable to mammals? Why were a small number of humans and their retinue of camp followers able to d so much damage? To understand that we need to refer back to the point David Steadman alluded to in the quote at the top of the page. Islands are frequently referred to as useful biological experiments that help illuminate biological patterns applicable to more complicated continental systems. And it is certainly true that islands have had an outsized influence, for example in helping Darwin and Wallace with the theory of evolution, or MacArthur and Wilson in kick-starting the rigorous science of ecology. But islands are also different to continents. And those differences are illuminating. The essence of islands, in terms of biology as well as so much else, is isolation. In this it should be pointed out that not all islands are equal. Britain is an island, but Britain did not suffer an avifaunal collapse like New Zealand did. Britain was attached to Europe at the last Ice Age, and remains close to Europe, and consequently its isolation is not as profound as that of New Zealand, which is a considerable distance from the nearest continent and has not been connected to a continent for over 60 million years. Species that can and do reach islands are therefore just a subset of the species that are found on mainlands. Mammals and amphibians are generally absent. There are exceptions; rodents managed to reach Christmas Island in the Indian Ocean and the Galapagos, and small canines managed to get out to the Falkland Islands. Frogs, somehow, made it to Fiji. But on the whole the only mammals on oceanic islands are bats and the only amphibians are ones that were on the island if it is one that broke off from the mainland (New Zealand or the Seychelles). The absence of mammals, amphibians, and many of the other continental species allowed two things to happen, it allowed other types of animals to take some of the niches left vacant by their absence (for example allowing weta to evolve into the rodent niche), and it allowed species to lose some of their anti-predator defences. And it is this second point that is the crucial one for the story. The evolutionary race between predator and prey is costly for both, and in the absence of need some of these defences can be lost remarkably quickly. The most obvious defence to be lost is that of flight. In this the rail family are world champions. Although rails are reluctant fliers they are nevertheless competent and at least one rail species seems to have reached almost every island in the Pacific (and elsewhere). Of the 800-1900 extinct bird species that David Steadman estimated were once found in the Pacific (which I mentioned last week), half of these are believed to have been rails. Pretty much every major island probably had not just a rail species, but a flightless and therefore endemic rail species. Larger islands had more than one species. Of these flightless rails only a few species survived to the Age of Exploration and fewer still survive today. Only Aldabra, Okinawa, Henderson Island, the Auckland Islands, Lord Howe, New Zealand and Inaccessible Island still hold examples of what was once the typical condition of this family (Guam no longer has wild examples, but the species there survives in captivity). Flightlessness was particularly common in the rails, but occurred in other families as well. To my mind one of the most peculiar examples was a New Zealand species, the New Zealand Owlet-nightjar. For a family which typically feeds mostly on the wing to become exclusively a ground species speaks of the insect richness New Zealand once held. Even if species remained able to fly they may have a reduction in their ability to fly. Kokako are able to fly but do so weakly and reluctantly. Flight is of course only one anti-predator defence. Species has suites of anti-predator behaviours, and these behaviours are lost on islands as well. It is necessary to maintain a level of vigilance against predators, to recognise a predator from a harmless species, and having seen and identified a threat, to react appropriately. Island species often lose these behaviours, in part or completely, as do seabirds that chose isolated islands to breed on. Anyone who has visited an island with insular species may have seen this type of loss, the names of some birds reflect it. Gooney birds (for albatrosses), boobies, noddies, dodos, all reflect this lack of fear of humans and the impression that these birds are in some way “stupid”. To combat this perception David Quammen suggested the term “ecological naivety“. 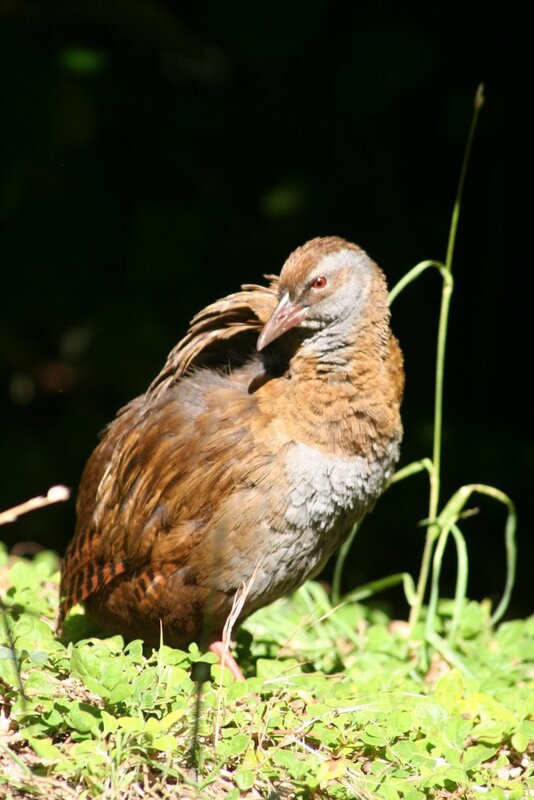 Weka are one of the few surviving flightless rails. Kapiti Island, photo by author. It should be noted that islands are not usually predator free. New Zealand was home to an eagle, a massive harrier, a falcon, two owls, the adzebills (large omnivorous terrestrial birds), weka, as well as skuas, gulls and Kea, parrots with a taste for meat. Most Pacific islands had at least one bird of prey, from the stilt-owls and hawks of Hawaii to the storm-petrel-munching Antipodes Green Parakeet on windswept Antipodes Island. When I talk of predator free environments, I really mean mammalian-predator free. The distinction matters. Predation by mammals and birds are two different animals. Birds hunt by sight, and mammals hunt by smell. This difference is most vividly demonstrated by the Kakapo, which when encountering a predator, hunkers down and relies on its camouflaged plumage to hide it. This works perfectly well for a visual predator, but had no effect on one locating its prey by scent. The correct response there is to flee, but evolution has left the Kakapo incapable to doing so. Little wonder that the Kakapo suffered so much. There are other, subtle differences between insular and mainland faunas. Insular species tend to shift their breeding behaviour towards the k-selected end of the spectrum, which is ecologist talk meaning the have fewer offspring and invest more effort in raising them. This is also the typical strategy of seabirds. Whereas an emu might lay several eggs per clutch, moa clutches re thought to have consisted of only one or at most two eggs. These populations tend to be stable, unlike the marked fluctuations of faster breeding systems, but more vulnerable to changes, particularly in adult mortality. Of the other reasons potentially given for avian extinctions, two are currently a problem and one may become one. Climate change was often suggested as a reason for extinction, but the recent history of Earth had been full of a great deal of it, with, at least in New Zealand, little impact on the avifauna. Disease on its own doesn’t explain prehistoric extinctions, but avian malaria introduced to Hawaii is having a deleterious effect on immunologically naïve birds; thus disease could have been a factor, but it would still have because of humans. Habitat loss too may have been a factor, but many species of island bird have been found clinging on for decades in tiny remnant scraps of habitat so long as they are free of introduced predation. I can’t believe it took so many scientists so long to accept mammalian predators as the main cause of island bird extinctions. Great posts Duncan. Thanks for bringing them to 10,000 Birds. Yeah great stuff, very well written. Thanks. Wow, I am going to become an ornitologist from reading these juicy and meaty posts. Thanks, great effort and great post! “I can’t believe it took so many scientists so long to accept mammalian predators as the main cause of island bird extinctions.” I can. It depends on your prejudices. I met a guy online who could not believe that cats could cause any ecological damage in Australia. He could accept foxes but not cats. He could accept that they did good but not bad. His personal love of cats blinded him. Everyone has some bias, the trick is to know when you are being blinded by it.